This economic snapshot published by the Dallas Morning News on 7 June 2015 gives great insight into the current new home market. For the original infographic, click HERE. Developers in Frisco have begun construction of an urban-style mixed-use village that will have almost 2,000 homes. The $500 million Canals at Grand Park development on Legacy Drive will have a variety of apartments, houses, townhomes and senior townhouses built around landscaped parks and waterways. Dallas-based Charter Holdings and Arcadia Realty Corp. are the developers of the land, which is west of Dallas North Tollway and near Frisco’s Main Street. Work has begun on the 152-acre project at Legacy and Cotton Gin Road. The first homes should be ready next year. 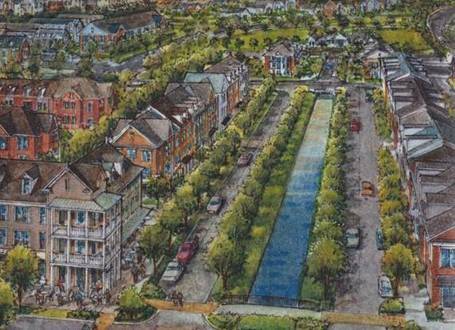 “We wanted this community to be developed with new urbanism, so it doesn’t look like a traditional suburban subdivision,” said Charter Holdings CEO Ray Washburne said Monday. “Since it is all coming up at once, it will be incredible.” “Our whole project will be in three phases,” said StreetLights CEO Doug Chesnut. “We will have the first phase finished late next year. “The units in the buildings will have walk-up front doors and front porches,” he said. “This is an old way of thinking that we forgot.” The single-family home neighborhoods will also be built with houses that front on tree-lined streets and face the almost dozen small parks and greenspaces. Builders including CB Jeni Homes, Darling Homes, Cambridge Homes, Normandy Homes and Drees Homes have bought the home sites, Gietema said. “It will be the late fourth quarter when we deliver the first building lots,” he said. With demand for new homes surging in Collin County, developer Huffines Communities is rushing to start work on a 1,400-home residential community. The almost 600-acre Inspiration development is under construction at the east end of Parker Road. 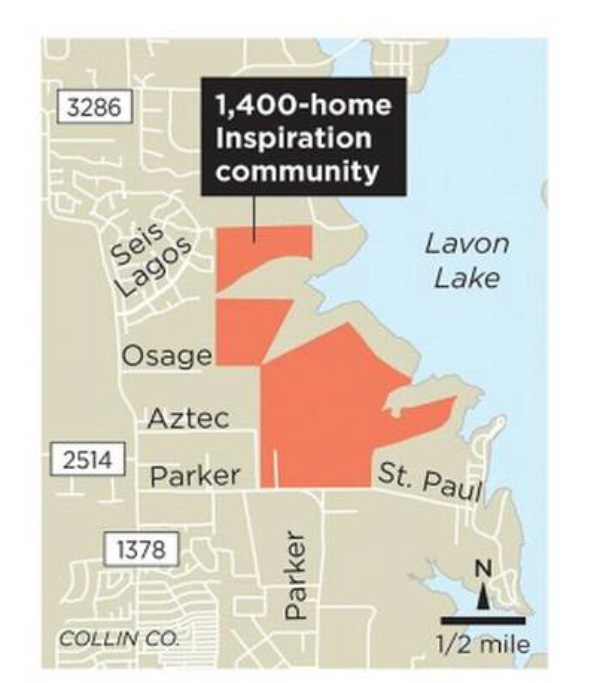 Construction has begun on the shores of Lake Lavon with the first 206 houses. Builders include Highland Homes, K. Hovnanian, Meritage, CastleRock, and Shaddock, and the average price will be $375,000. Inspiration will have a community center with a pool and an outdoor pavilion. 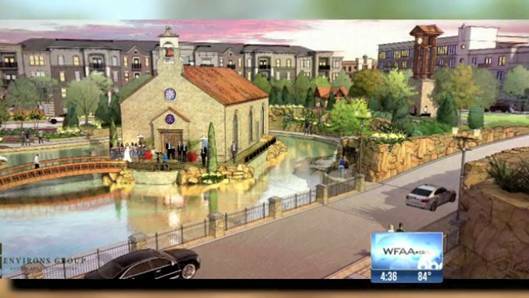 Crews in Flower Mound are well on their way to create a massive $16 million development anchored by a body of water that doesn’t exist yet. They are currently working to divert water from three surrounding ponds to form the modest river. The goal is to create a “river walk.” “It’s very difficult. It takes some trenching, some building of some wells, in order to infiltrate restoring and retaining the water in that particular location,” explained Alvin Jackson with Centurion American, the lead developer on the project. Flower Mound voters approved the multi-million dollar project through the creation of a Public Improvement District back in November. The creation of a PID allows the developer to levy assessments on the river walk property, and revenue generated would go to future economic development. The hope is that a water feature will attract business. The mixed-use development will include restaurants, shops and housing along the waterway. It’s a massive, ambitious project happening all at once. Jackson predicts the water feature will be complete by October. They plan to release a list of stores and restaurants by mid-summer. Posted: May 7, 2013 | Author: Living Large in DFW | Filed under: New Construction Homes | Tags: business, economy, new construction homes, real-estate | Comments Off on Home Shopping: Should you buy new? Last year housing permits hit their highest level since 2008, according to the Census Bureau, and new-home sales grew 20% from the prior year. “Builders are more optimistic than they have been for several years,” says Patrick Newport, an economist at IHS Global Insight. An untouched abode offers advantages, of course, such as a sleek modern layout and few repairs. Buying an existing home, however, may allow you to seal the deal faster and can offer better short-term price appreciation. Head-to-head comparisons can help you decide which choice better fits your priorities. To see the full article and compare which is better for you, click here.